Ride Hard and Loot Everything! 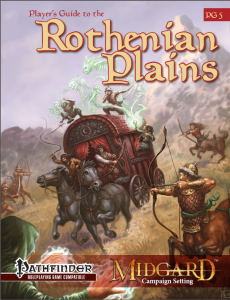 In Midgard’s Rothenian Plain, the dangers are everywhere: slavers, demonic warlock, raiding centaur bands, bandits and more . But on the open grasslands, it is easy to make a life of banditry and adventure as well, for a fresh start is just over the horizon. The centaur shamans, human horsemen, and elvish archers of the Plains are all justly famous for their skill and daring. 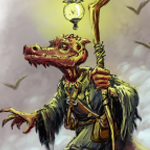 Join their ranks with new archetypes, all-new gear, marvelous spells, and more than 100 new options for Pathfinder RPG! 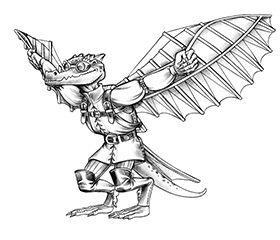 Pick up the Player’s Guide to the Rothenian Plains at DriveThru RPG or Paizo today, and get ready to ride to glory! This would be the creation of one Adam Roy. :D Congrats, Adam! Raging centaur art on pg. 13 is the best!